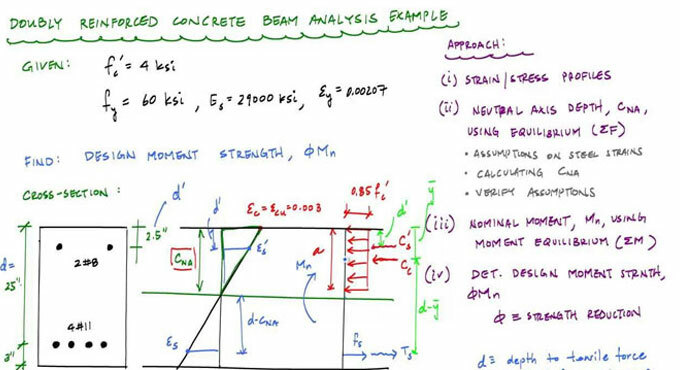 This construction video shows the detailed processes for measuring the design moment strength concerning a doubly reinforced concrete section. Part 2: calculating nominal moment, strength reduction factor, design moment strength. By going through this construction video, one can resolve any problem associated with reinforcement concrete design. A doubly reinforced concrete section is reinforced in both compression and tension regions. The section of the beam or slab may look like a rectangle, T and L section. The analysis of doubly reinforced section finds out the amount of moment of resistance with breadth, depth, area of tension and compression steels and their covers. The design of a doubly reinforced sector finds out the cross sectional dimensions and areas of tension and compression reinforcements.